Paul Castillo directs Michigan Medicine's integrated financial operations, which includes the U-M Hospitals and Health Centers, the U-M Medical School, the clinical services of the U-M School of Nursing, a shared administrative services division and the Michigan Health Corporation, the legal entity that allows Michigan Medicine to enter partnerships. 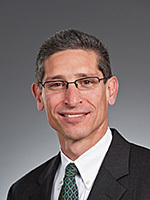 Prior to arriving at Michigan in November, 2011, Paul was the Chief Financial Officer and Vice President of Finance at UPMC Presbyterian Shadyside, the flagship hospital of the health system associated with the University of Pittsburgh. Before taking his role at UPMC Presbyterian Shadyside, Paul held top financial positions in the UPMC Community physician group, UPMC Corporate Services, and UPMC McKeesport Hospital. In the early 1990s, he was Vice President of Finance at St. Vincent Health System in Erie, PA, which he joined after more than a decade with the Arthur Andersen & Company accounting firm. Paul's expertise includes implementing changes in health information systems, negotiating major contracts, assisting in physician recruitment and retention efforts, and developing financial analysis tools. He holds a bachelor's degree in Accounting from Michigan State University.